Screenwriters Forum brings together professional writers and aspiring writers for mutual benefit and provides a representative voice, and an industry- and public-facing organisation to promote their interests and create opportunities for them. Take a look around our site to see how we can support your writing and production career! Following on from writer-director Dave Squire and filmmaker Cameron Caan, upcoming Script Development Group industry guests are likely to include: Liz John (DOCTORS), March 5th; Tim Stimpson (THE ARCHERS, the Writers’ Guild), April 2nd. More info below! We’re currently running our popular and acclaimed Screenwriters Forum Course once again! First run in 2018, the quality of the course was rated above 90% by users. The course takes place on the last Monday of each month (except in May, when it’s moved to the last Tuesday to avoid the Bank Holiday) and is for any writer of film, television, or video games, whether you’re a pro or a newbie still learning your way. Our aim is to help you on your way. CLICK HERE to find out more, or book your place on Eventbrite here: https://www.eventbrite.co.uk/e/introduction-to-professional-screenwriting-course-tickets-53572945121. Special discounts are available for Producers’ Forum members and BCU students; you can also contact support@friendlycreatives.co.uk if you have any further questions or enquiries! An excellent way to script consultancy from industry professionals and potential audiences, at an unbeatable price! Click here to find out more, and click here to sign up at our Eventbrite page: https://screenwritersforum.eventbrite.co.uk! Only registered users can be allowed access, due to BCU’s security lists, so don’t forget to sign up in advance! Introducing Screenwriters Forum – We’re an organisation run by and for professional and aspiring writers for TV, film and video games, based in West Midlands of the UK since 2006. We run Screenwriting courses and an ongoing monthly Script Development Group which includes a half-hour Mini-Masterclass from an industry expert and an hour feeding back on script submissions from the attendees. Our Chair runs an international script agency, and our other professional members include notable writers on many familiar series such as Doctors and The Archers. Our SCRIPT DEVELOPMENT GROUP with Mini-Masterclasses are a popular monthly opportunity for professional and aspiring writers to get the input of professional writers and their peers to help build their work towards an industry commission. These are currently running on the first Tuesdays of every month at BCU’s Curzon Building (by Millennium Point) at 7pm but have the scope to expand to other locations and times on request! Email our publicist Jamie White (support@friendlycreatives.co.uk) to confirm your interest and attendance. SWF has entered a new partnership with Birmingham City University, who host many of our events as we provide them and their students with access to local industry professionals and our industry guest speakers. Our Chair Ian Kennedy is Director of World Wide Development at Hollywood script development company WriteMovies, a role that has been created to bridge the gap between UK and global writers and Hollywood studios. WriteMovies has been helping thousands of writers since 2000 and has given Oscar-nominated writers their first access to the studio system. For any enquiries or further information, contact Ian Kennedy on ian@iqkennedy.co.uk. Taking Time promotional still. Starring Denny Hodge. 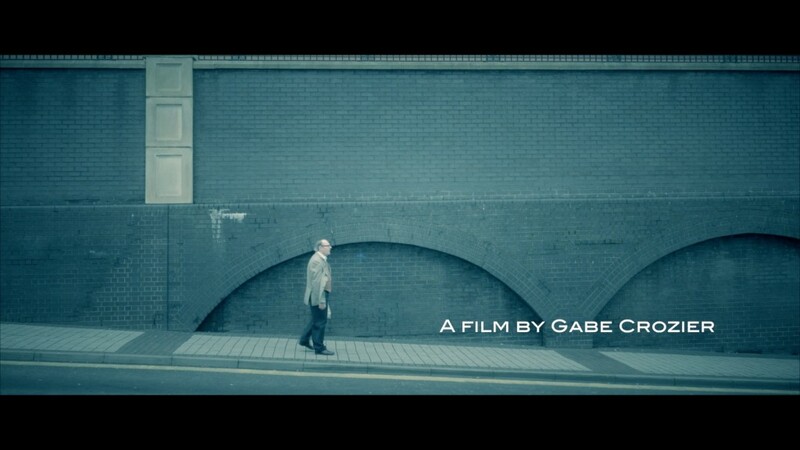 Directed by Gabe Crozier. The West Midlands Screenwriters’ Forum was founded in 2007 to provide a cohesive voice for professional screenwriters working in the region. All of our members have at least one screen credit working in film, TV or the computer games industries. You can follow us on Twitter at @ScreenwritersFm! Our successful public launch event in 2016 – which included the premiere of our jointly-written short film TAKING TIME, and our appearance on BBC Midlands Today – announced us as a public-facing organisation. We organise professional development opportunities, share industry knowledge, improve networking with other regional film-makers and inspire new creative partnerships; we strive to help regional screenwriters succeed. We are soon looking to launch a Script Development Group for established and aspiring screenwriters to develop their work and each other’s together: email our Chair Ian Kennedy (ian@iqkennedy.co.uk) to find out more. Ian’s website also contains insights and tips for writers and further information about what he’s up to for Screenwriters’ Forum – click here to go to it. We are always seeking to identify new members to join our expanding network. If you are a professional screenwriter working in the West Midlands please contact us. Join us on the first Tuesday evening of every month (except Augusts, when everyone will be on holiday!) to gain mini-masterclasses from established industry professionals and to get the input of professional screenwriters, Screenwriters Forum members and other writers like you on your work and ideas. Our generous hosts are Birmingham City University and the venue is the prestigious boardroom of their Curzon Building (room C503), looking out across Millennium Point, Eastside Park and Birmingham City Centre. The venue is a short, well-lit walk directly from Birmingham New Street Station and Moor Street Station (about 10 minutes). If you’re thinking of coming, please notify our Chair Ian Kennedy (ian@iqkennedy.co.uk) in advance, as BCU’s security will be unable to allow admission to anyone who has not preregistered. So if in doubt, tell us you’ll be coming! That’s better than you arriving unannounced and unfortunately being refused entry. Arrive for 6.30pm so we can begin the sessions at 7pm. The sessions will run till around 9pm. The sessions are built around the preferences of the attendees. Script Development Group attendees get to choose between many potential subjects and contributors for their mini-masterclasses, and to share any parts of their work that they choose to – or to simply go with the flow and learn from what other people share and the feedback they get! The goal of the group is to secure every participant an industry commission, so that we can welcome them as a full SWF member. 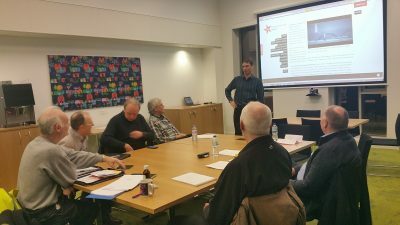 Feedback will be constructive and supportive but professional – if you’re keen on the idea of developing your writing in classes, but unsure that you’re ready to work towards becoming a recognised industry professional, you might prefer Ian’s open-access Creative Writing courses across the city. The cost of the sessions is £15 per person per session, or £60 for five sessions if booked in advance. BCU’s Screenwriting students can enjoy a special discount – ask us for details. We look forward to meeting you at one of our Script Development Group meetings soon! Email ian@iqkennedy.co.uk for further details. 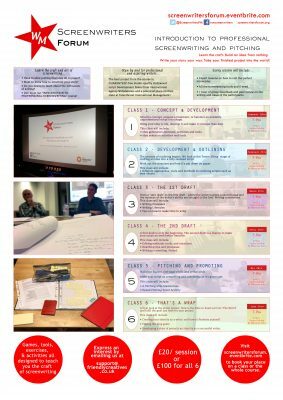 This popular and acclaimed Screenwriters Forum Course ran successfully across the first six months of 2018 and is open for new expressions of interest to run again: contact support@friendlycreatives.co.uk to express your interest. This course is for any writer of film, television, or video games, whether you’re a pro or a newbie still learning your way. Our aim is to help you on your way, and users rated the quality of the session above 90% throughout the course! Run by and for aspiring writers for film, TV, and video games with every class delivered by experienced and expert screenwriters. What’s more, we’ve even provided professional actors to dramatise scenes of the writers’ scripts, which the writers found to be extremely insightful and illuminating experience. Our Introduction to Professional Screenwriting Course in early 2018 (which is likely to run again in 2019) was rated by its 23 users (on a scale from ‘Very Good’ to ‘Very Poor’, in over 50 feedback forms provided across the course) over 90% overall, with ratings of 93% for its presenters, over 90% for its Content and Media, and almost 90% for its Handouts and Activities. User confidence in the subject grew on average over 18% per session, and user confidence in their own projects grew over 17% too – per session! All of these feedback forms and testimonials are available for you to view on request. Join our sessions to grow your confidence and your projects with industry experts and your peers, every time. Our friends at international screenwriting company WriteMovies are offering FREE Hollywood Development Notes – and potentially a place on their slate of projects that they guarantee to pitch to industry – to the best project to emerge from the course! We’re proud to announce JULIAN AUSTWICK and his script BELIEF as our first winner of this prize – congratulations Julian! Please address any queries to support@friendlycreatives.co.uk. Lead actor Denny Hodge begins his journey as Edward in TAKING TIME. Denny’s performance was pivotal in bringing continuity and a compelling character journey to a story that had come together from combinations of unexpected scenes. The project was proposed and delivered by director Gabe Crozier. Our unique, jointly-written, experimental collaborative short film TAKING TIME had its first screening in February 2016. The film was featured on BBC Midlands Today on February 2nd 2016, the day of its premiere at the Mockingbird Theatre in Birmingham, and we will also appear on Big Centre TV‘s film programme BRUMMIEWOOD YAMMYWOOD to discuss it (March 11th, 10pm). Thanks once again to everyone who helped make it possible: this gallery celebrates everyone who gave their own time to the filming of the project – we’re hugely grateful to you all. So how did it happen? Well, we hosted local filmmaker Gabe Crozier as our guest for a session, and afterwards he proposed making this film, with the concept of letting writers each separately contribute a minute of script each to a unique project. He came up with a core character – but left the story open to invention. 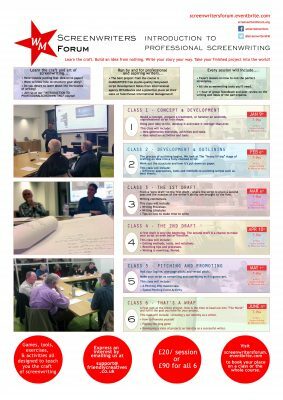 The idea was floated by email the next day by our Chair Ian Kennedy, and after at least 16 enthusiastic email replies later that day, the concept had taken shape and many writers were committed to the project. Ian then set them a deadline for a first draft of a one-minute passage of script. When those were received, Ian collated them, and provided a synopsis to the writers, ready for them to adapt and rewrite their scenes to fit into the new bigger picture. The new-look scenes were returned, Ian adapted them into a single script, and the process began to refine, cast and produce the script. The writers were our members William Gallagher, Andy Conway, Liz John, Mark Brendan and Nicola Jones, plus Ian Kennedy. The outcome is an experimental 14-minute film at cinema-quality production values. Because the process was experimental from start to finish, we’ve not imposed any rewrites on the writers, nor amended their scripts if it could be avoided. The end product was then in the hands of our casting and editing – plus the grading and soundtrack and composition added by Gabe. We’re happy with the process and the end product, considering the process that generated it, and we’ll be happy to share this work with film festivals and others wherever it is of interest! Our unique, jointly-written, experimental collaborative short film TAKING TIME had its first screening in February 2016. This gallery celebrates everyone who gave their own time to the filming of the project – we’re hugely grateful to you all. The film was featured on BBC Midlands Today on February 2nd 2016, the day of its premiere at the Mockingbird Theatre in Birmingham, and we also appeared on Big Centre TV‘s film programme BRUMMIEWOOD YAMMYWOOD to discuss it (March 11th 2016, 10pm). Thanks once again to everyone who helped make it possible, and especially to the actors named below. Lead actor Denny Hodge begins his journey as Edward in TAKING TIME. The project was proposed and delivered by director Gabe Crozier, assisted by Ian Kennedy. 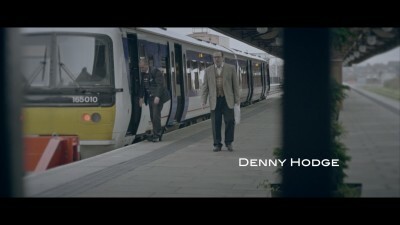 Lead actor Denny Hodge begins to set the tone and pace of the 14-minute film, as his character Edward slowly makes his way towards his daily work, already left far behind by his fellow commuters. Former standup comedian Denny was separately recommended by two different colleagues for the part to us. Denny brought an understated intensity to the film which enabled much of the story to be carried without dialogue. In his clock shop, Edward (Denny Hodge) feels alienated by the mass-produced modern technology he is expected to work on nowadays in order to maintain his traditional business. Special thanks to Ron and Chris Croton for providing this evocative filming location. 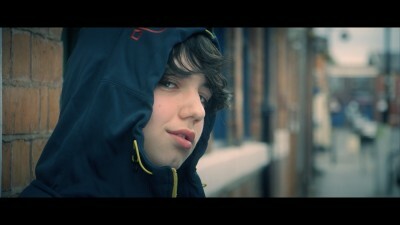 Edward (Denny Hodge) encounters a scene of potential bullying – and theft of a boy’s bike – in the street. Mehdi (Josh Malhi) interrupts Edward (Denny Hodge) in his solitude, bringing energy and a quirky contrast between the clockwork-loving Edward and a young digital native playing a smartphone game. All of our young actors were cast thanks to Ross Berkeley Simpson of First Act Workshops, to whom we are very grateful, along with the actors themselves and their families who gave up hours of their weekend to make this shoot possible. 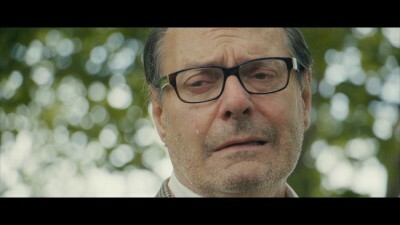 After being jolted from a particularly vivid recollection, Edward (Denny Hodge) is left feeling hurt and alone. 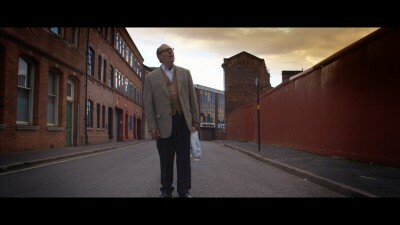 Edward’s (Denny Hodge) descent into his own past brings him into a deserted cobbled alley, in search of memories of his father. 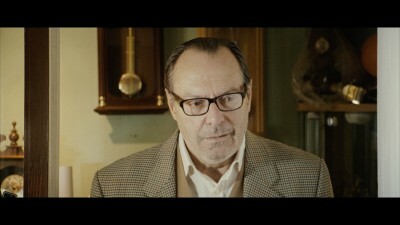 Edward (Denny Hodge) faces the prospect of his own mortality. Our final view of Edward (Denny Hodge) as his time ebbs away. 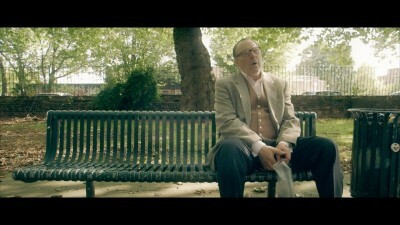 Respite from urban fears and dangers for Edward (Denny Hodge) in a local park after an alarming encounter. 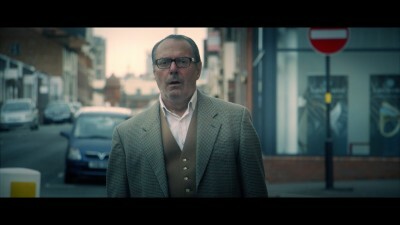 Edward (Denny Hodge) arrives at his place of sanctuary, his historic clock shop. Location provided by Ron and Chris Croton. Vulnerable local girl Chloe (Ruth Chavez) looks fondly in as Edward (Denny Hodge) works in his shop – but trouble is arriving in the car behind her. Chloe (Ruth Chavez) reflects on her own potentially dangerous situation as she waits for friends to arrive. Older man Jake (Sam Cole) confronts Chloe and tries to talk her into joining him in his car. Chloe’s friend Alice (Amy-Beth Shah) tries to talk her into joining them in a potentially dangerous situation with older men. Jake (Sam Cole) is put out by Chloe’s (Ruth Chavez) stand-offish reaction, watched by Alice (Amy-Beth Shah) and Edward (Denny Hodge). 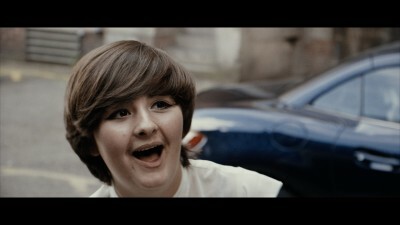 Local bully Cameron (Tom Brookes) senses an opportunity when a young boy approaches on his new bike. 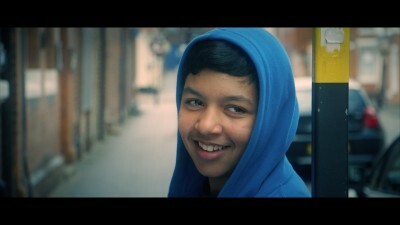 Cameron’s friend Sai (Ryan Malhi) laughs at the prospect of what’s coming their way. Bullies Cameron (Tom Brookes) and Sai (Ryan Malhi) eye up their next victim. 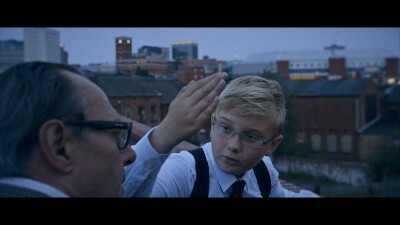 Surprised to be let through by the bullies – thanks to Edward’s subtle intervention – young boy Michael (Oliver Benbow) continues cautiously on his way. Young boy Mehdi (Josh Malhi) is immersed in his video game. Edward experiences a vision of a young girl, perhaps his daughter or granddaughter (Mia Pearson). 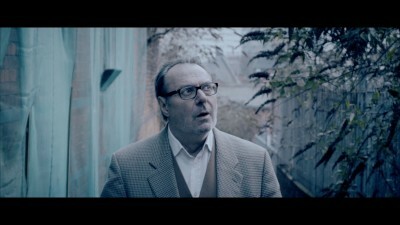 Michael (Oliver Benbow) catches up to Edward (Denny Hodge), unwittingly stumbling upon his final moments. 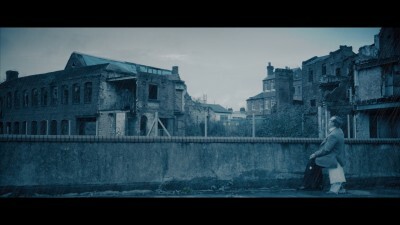 Edward (Denny Hodge) arrives at a derelict site, in search of memories of his father. Jess (Nicoletta Barrett) is distracted and neglects the young girl she is responsible for – until noticing who the girl is dancing with. 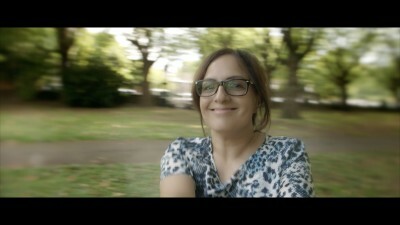 Edward reimagines an upsetting encounter with Mehdi’s mother (Rashi Malhi) as a happier moment. “Earth to old guy?” – Michael (Oliver Benbow) is too young to recognise Edward (Denny Hodge) entering his final decline – with fateful consequences. Need a screenwriter, script editor or consultant? Our members are a versatile bunch, but in case you’re looking for someone who has already been professionally commissioned and produced for a specific area in the past, here is a quick list of some of the writers to watch out for among our currently active members. 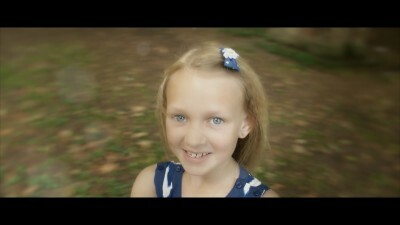 Short films: too many of us to list! We’ll show off our full member list and profiles in a new format again soon! Reaching beyond our internal network of professional screenwriters we actively seek partnerships with other organisations with similar goals. Please send any and all ideas on how to address these needs to info@producersforum.org.uk. New partners are soon to be announced! Script Development Group – OPEN TO ALL! Click here to find out more. 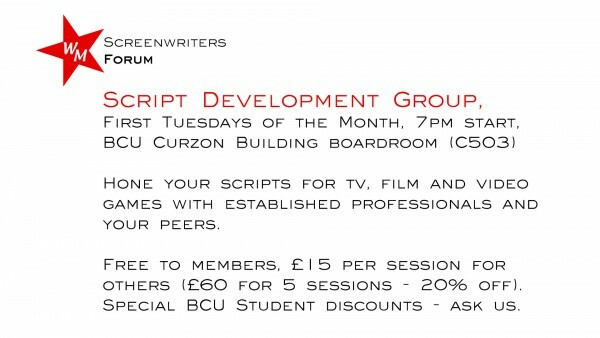 The Script Development Group runs on the first Tuesday of every month at 7pm at Birmingham City University’s Curzon Building, but preregistration is essential – email ian@iqkennedy.co.uk for information. MEMBERS MEETINGS: We aim to meet regularly in and around Birmingham city centre, inviting speakers to discuss their screen-based work and network with our members. Contact our Chair Ian Kennedy (ian@iqkennedy.co.uk) for more information. If you would like to join the Screenwriters’ Forum, have an idea for an event or just want to say hi, we would love to hear from you. You can follow us and engage with us on Twitter at @ScreenwritersFm!